Dubai tax free living has always been a magnet for skilled expats from all over the world. Indeed, the idea of working in Dubai and having an opportunity to grow your personal wealth without tax reductions is extremely appealing. Are you a tax resident in Dubai? What is your tax residency? It’s true that the UAE zero income tax is one of the pros of living in Dubai. Like the rest of the UAE Dubai earns its revenue mainly through the oil industry and uses its no-tax policy to attract skilled expats and global companies to diversify and enrich its economy further. However, that sounds far too good to be true, doesn’t it? Which is why, in this article we’re going to lay out the truth about tax in Dubai and the UAE taxation system to see what you pay and what you don’t pay when it comes to taxes in Dubai. Are the UAE taxes different from Dubai taxes? Well, there is no unified federal tax legislation in the UAE. That is why although most UAE tax rules and international agreements work in all the Emirate, there are cases when each emirate can set their own tax rules. As an example, most DTTs cover the whole UAE, but the actual taxes in each emirate can be decided on a local level. The Emirates don’t levy any personal tax or capital tax. It’s true for both UAE citizens and expats. As a result, there is no special taxation regime for expat workers in the UAE as they are treated the same way as citizens when it comes to personal or capital income tax. Most Emirates impose a rental tax and the rules may vary in different Emirates. Renting a property in Dubai, for example, adds 5% of annual rent to the bill for residential tenants. In Abu Dhabi expat tenants pay 3% of annual rent whereas UAE citizens do not pay any rental tax. All tenants pay 2% of annual rent as rental tax in Sharjah. Municipalities also impose tax on services which has an impact on your bills in restaurants and hotels. Again, it varies from Emirate to Emirate. Tourists might find that they’ve been charged up 10% tax on the room rate, 10% on service charge and 10% on municipality fees. Some tourist facilities may also charge a city tax (ranging from 6 to 10%) and 6% tourism fee. You will also be charged a property tax if you transfer a property in the UAE: 4% in the Emirate of Dubai and 2% in the Emirate of Abu Dhabi. There are no withholding taxes in the UAE levied on a federal level. As of 2018 the UAE have signed 115 double-taxation treaties with most of them aimed to prevent double taxation of income, capital gains, reduce tax on dividends and tax-exempt deposits. All the federal level tax laws cover Dubai as well: there is no income tax in Dubai, VAT is levied at a national level and Dubai inherits and benefits from all the DTTs signed by the UAE. Locally, however, some of Dubai taxes can differ from the rest of the UAE. The zero income tax policy in Dubai won’t be changed in the foreseeable future. Sheikh Mohammed bin Rashid Al Maktoum, the Vice-President and Prime Minister of the UAE and the Ruler of Dubai stated that his country would never adopt an income tax as a way to tackle the deficit. My country would never adopt an income tax as a way to tackle the deficit. My reply is: No income taxes. This means that it is unlikely that tax will ever be levied on an individual’s income in Dubai. Dubai residents also enjoy tax-free rental income, no stamp duty, no tax on capital gains or inheritance. However, just because you reside in Dubai, it doesn’t mean that you can enjoy a tax-free income. The main question is your tax residency. This is a very important question which actually defines whether you pay tax when working in Dubai or not. If you earn your income in Dubai but are tax resident elsewhere, you may be subject to taxation on your income. This is because most expats pay tax according to their residency. If you take a 6-month contract in Dubai and live and work in the emirate for just 6 months, you are likely to remain ordinary resident in your home country for tax purposes and your income could be subject to your home country taxation. If you live elsewhere and have an investment property in Dubai from which you earn a rental income, you will have to declare this income on your tax return in the country of your tax residence and potentially pay tax on it if your overall earnings are above the nil rate band for income tax. If you move to Dubai for a long term, or you are out of your home country for a long enough period to qualify you as a non-resident for tax purposes, then you may be able to earn your salary in Dubai 100% free of income taxation. Many countries qualify their citizens for tax purposes based on a tax year. From this point of view the question when you leave your country of domicile for Dubai is crucial. If you spend the most part of the current tax year in your country of domicile, you might be considered a tax resident for that tax year by the tax authorities and taxed on your income for the whole year regardless of the fact that part of the income for that year was earned in Dubai. If you are a UK citizen and UK domiciled, for example, even a year-long contract in Dubai can be not enough to exempt you from your income tax obligations in the UK, as it might cover just half of the current tax year and half of the next tax year. 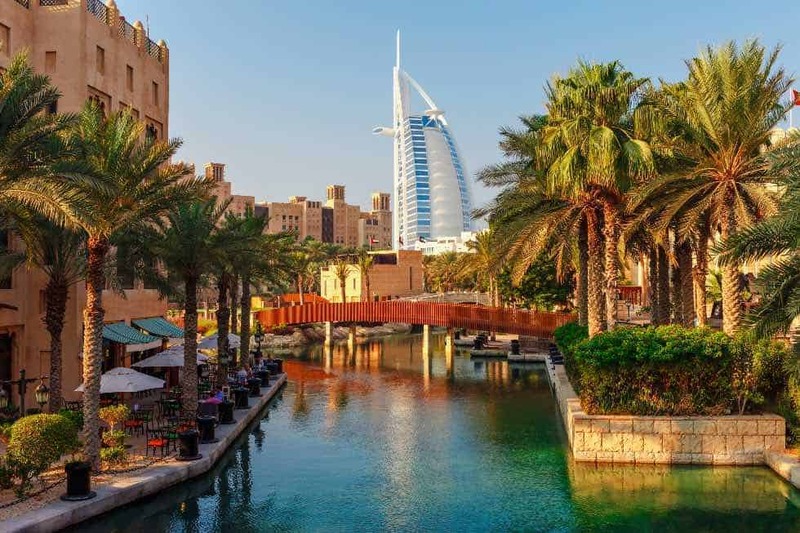 The good news is that as long as your stay in Dubai covers the qualifying part of a tax year in your country of domicile, you most likely will be able to enjoy your Dubai income tax free. Every person’s position is unique, and you have to be fully clear about your tax status and obligation for taxation at home or abroad – mistakes can cost dearly when it comes to tax! In terms of any other taxes in Dubai – they do exist contrary to popular belief. For a start, the profits of international banks and energy firms are taxed at the federal level – which is probably no bad thing! Alcohol is heavily taxed upon importation. It’s 50% to bring it in to the country and then another 30% if you have a liquor license and buy alcohol for home consumption. What’s more, you’re taxed on any visit to a hotel in Dubai for a stay or even a meal out. Tax adds 10% to your bill and is called Dubai tourist tax. This tourist tax in Dubai is included into the bill and imposed on every guest staying at a hotel, guestroom or a hotel apartment. As a result it can cost you 7 to 20 dirhams per night depending on the type of the hotel and its rating. A relatively cheap guest house will charge 7 AED, while 5 star hotels will add 20 AED per night. There is also a form of council tax secretly levied when you pay your utility bills – and many people protest against this tax as it is supposedly for street lighting, waste collection etc., and yet most residents pay for this through maintenance fees. So, you are effectively charged council tax in Dubai twice – oh and there is a 10% municipality tax as well as a 5% municipality tax on rented accommodations collected through utility bills. A departure tax in Dubai is charged when you’re buying an airplane ticket for a plane that either lands or takes off at one of the Dubai airports. The Dubai departure tax is included into the price of the ticket, no matter where you purchase it. Children below the age of two, transit passengers and members of the cabin crew are exempt of paying this kind of Dubai tourist tax. You will have to pay 4 AED toll tax on crossing every toll booth in Dubai. There is also 10 AED knowledge tax + 10 AED innovation tax on using government services. If you are using centralised cooling system (district cooling) you might find that your bills are much higher than those for traditional individual air conditioning units. Although formally it’s not a tax, however, it’s a bill for you to pay to the district cooling companies for their investments into innovative technologies. With the introduction of the mandatory health insurance in Dubai there might be additional charges depending on your work contract. In some cases, it might result in your potential tax savings being reduced by extra costs of the healthcare. VAT was introduced in the UAE in January 2018 on a federal level. VAT is charged at a rate of 5%. The exception is food items, health, education, petroleum products, social services and bicycles. The financial services and residential property sectors are also exempt from VAT (with certain exceptions). You can potentially earn your salary 100% free of tax in Dubai if you are tax resident in the emirate and have no other obligation to any other state for the payment of tax on foreign earned and sourced income. However, there are taxes that you will encounter if you live in Dubai, and if you want to make sure you fully understand your personal tax obligations it is recommended you speak to an accountant.